Why are chocolate chip cookies soft and chewy one time, thin and crisp another? Why do soft cookies get hard, and crisp cookies get soft? Perfection in a cookie is a matter of individual preference. And no cookie is judged more closely and more frequently than the chocolate chip. The burning issue is how to make the cookie turn out the way you want, every time. Curiously, most cooks who asked for help use the same chocolate chip cookie recipe—the one on the back of the Nestlé chocolate chip bag. It’s a reliable recipe, but subtle changes produce surprising differences. To determine which factors influence the final cookie, we used the wrapper recipe and baked more than 25 variations. Each batch was slightly different, and changes in proportions, mixing methods, and baking were carefully controlled. The goal: to learn how to make the chocolate chip cookie that matches your favorite adjectives. Why are some cookies cakelike instead of chewy? A little extra liquid in the cookie dough from water, egg, or milk makes the dough more elastic and adds steam as the cookies bake, making them puff more. What makes a cookie crisp or crunchy? Reducing the amount of ingredients that hold moisture–flour, egg, and brown sugar–makes it easy for liquid to evaporate, producing crisp cookies. The fat, which goes up proportionately when other ingredients are cut back, gets hotter than the water in the dough and drives out the moisture. Fat also makes the dough softer and melts when hot, making the cookies spread. 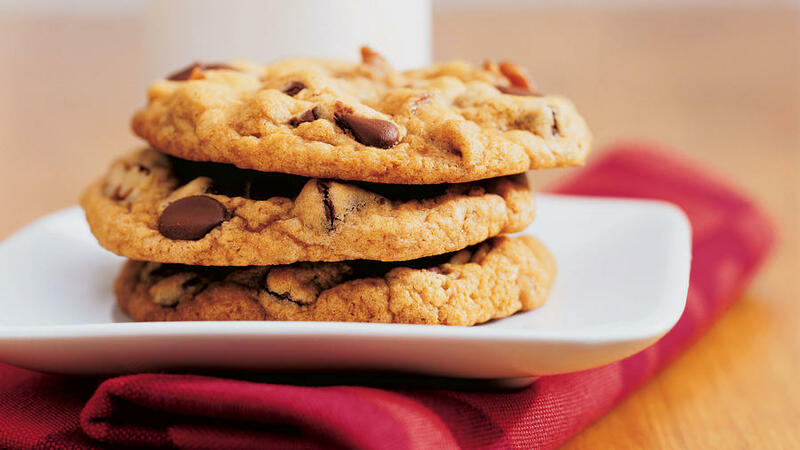 For crispness, bake cookies longer at a lower temperature to give them more time to spread before they firm. Then bake long enough to dry and brown them evenly to develop the maximum toasty flavor and crisp texture throughout. What else makes cookies spread as they bake? We’ve had many calls and letters from cooks having trouble with favorite recipes. All of a sudden, their cookies are spreading excessively. Most often the culprit is low-fat butter or margarine spread, which has about 20 percent more water, used in place of regular butter or margarine. It’s this extra liquid that’s causing the problem. Low-fat products can’t be used interchangeably with regular fats for baking without recipe adjustments. Cookies also spread when you drop high-fat dough onto a hot baking sheet; the heat melts the dough, and cookies spread before they’re baked enough to hold their shape. “When others follow my recipe for chocolate chip cookies, they turn out crunchy. Mine turn out chewy. Why?” asks Bobbie Barrett of San Carlos, California. The way they measure ingredients and the real temperature of their ovens are the usual reasons cooks get different results from the same recipe. Flour should be stirred to loosen and fluff it, then spooned gently into a dry-measure cup (the kind you fill to the rim), and the top scraped level. If you tap the cup or scoop flour from the bag, the flour gets packed down and you can easily add 2 to 4 extra tablespoons flour per cup. You can scoop up white sugar; it doesn’t pack. But you should firmly pack brown sugar into a dry-measure cup and scrape the top level. Dry ingredients should not be measured in heaped-up cups or spoons; scrape dry ingredients level with the surface of the measuring tool. Measure liquid ingredients with liquid-measuring (usually glass or plastic) cups. If your cookies bake faster or slower than the recipe indicates they should, chances are your oven thermostat isn’t registering accurately. It’s a good idea to double-check oven temperature with a thermometer and adjust oven setting as needed.